Last week I started a new series called Road Trip Reading. It's a series of posts that share road trip games. The purpose of these road trip games are to bring literacy activities on the road with you this summer. For the next few months, I'm going to try and pop in here on the blog and share some of our road trip reading tips. I've also started a Pinterest board for all things Road Trip Reading. Stop by for an idea or leave your Pinterest information below and collaborate with me in creating the board! Last week, we prepared for the road trip by writing packing lists. 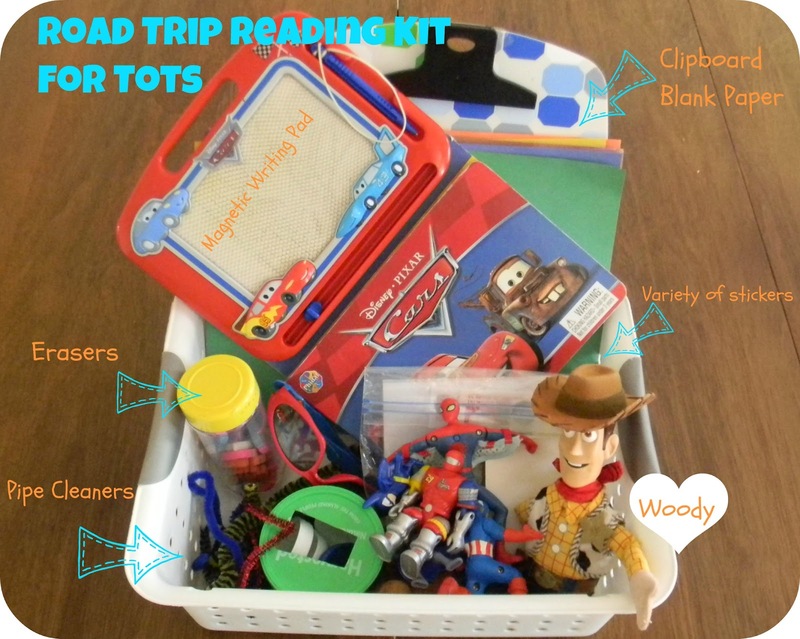 This week's road trip reading tip is to pack a basket/ tub/ tote of travel supplies. Most parents try to pack along road trip games to keep kids entertained on long car rides. Why not sneak in some literacy friendly objects to help your child learn a little along the way? This was my basket for my 2 year old. He enjoys repetition so I tried to keep it fairly simple. I included some toys, his favorite doll, Woody. I also included games where he had to drop lids into a can and drop erasers into a container. I infused literacy into this basket by including paper and clipboards and a variety of writing tools-- crayons, markers, and pens. Pens are a crazy big deal in my house! I also included a magnetic writing pad to give him variety in writing surfaces. I included notepads and a variety of stickers. I gave his prewriting fingers a workout with pipecleaners. We could shape those into objects and tell stories with the objects as well! I packed tons of road trip games for my four year old. Maybe too much? He was in the very back seat of the van and I wanted him to be able to choose activities that interested him. I packed a dry erase board which was good for coloring. It was magnetic so we also used it for magnetic letters and gears. I also included various stickers, notepads, and blank paper. I included magazines and a few books. I had brought extra books along in a different bag as well. He enjoyed doing workbooks and sticker books as we drove. He also loved his Melissa and Doug lace and trace cards as well as his Leapster. Mostly, he doesn't leave home without the ol' Leapster Explorer! These boxes kept the boys happy and pretty quiet all the way to Branson and home again. My kids are not big on sleeping in the car so having something to keep them entertained is nice. Have you created Road Trip Games for your kids? What are your road trip with kids must-haves? I have four kids under the age of 10. This is a great idea for summer road trips. I am going to include it in my blog. I love these baskets! I'll have to put some together so we can keep the DVD player off for longer on long road trips! great ideas! my almost-3-year-old and I both get motion sickness if we read or write or watch DVDs, so it's great to see other ideas like the cap game and pipe cleaners. Thanks! That's funny...markers are a big deal at our house. He wants all of the lids off and he carries them around constantly!! Luckily they are the ones that only write on special paper. I always said that I wouldn't get a DVD player, but it has been a lifesaver. Thanks for sharing these great ideas! Pinning them for our travel this summer! You are done the great job for writing the wonder full blog.I am highly obalized to get the opportunity to read the blog like that. Thanks for mentioning our Lace & Trace Cards. I love these ideas for the travel kits! 3 or 4 of the above comments are spam, Jackie. On May 18 but obviously not Meliesa and Doug. Their signatures change when the page is refreshed. Will pass this post on to some of my toddler mommy friends! Some great ideas here! Back in the '70s when I was a kid (I just aged myself!) we did very long summer road trips. My mum was a master at keeping us busy with math and literacy activities - she made up her own Bingo cards with items we had to look for (a cow, tractor, red truck etc.) and would reward us with one Lifesaver. We'd also have to do oral math / spelling / counting etc... it made the time fly by! Activities like this are so great for parents AND preschoolers! My son would love to have this by him on a roadtrip! What wonderful things it contains. I love the basket idea! We recently drove from Rhode Island to the Midwest (including a stop in the St. Louis area) with our 2 year old. He picked his own bag of fun, but I also brought a variety of surprises that I wrapped. Some days those extra minutes to unwrap were most welcome! 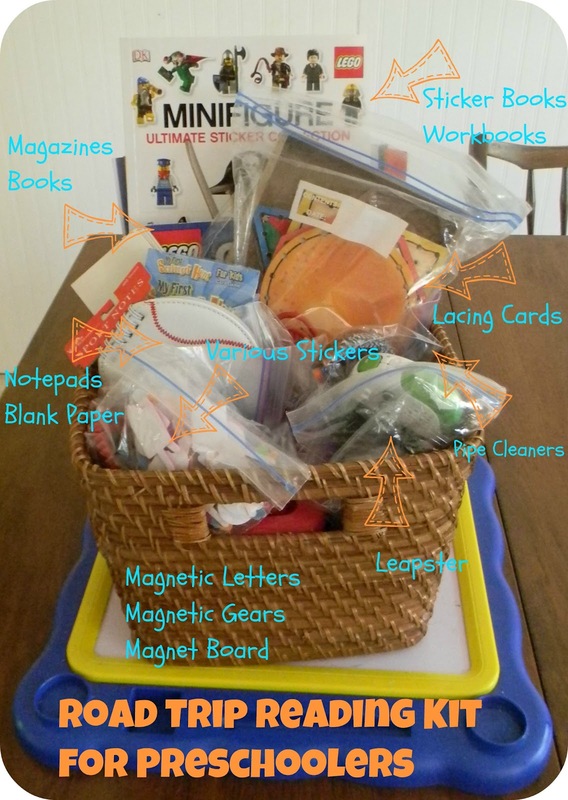 The surprises were things like a travel bingo that I made, a travel tray that's magnetic, magnetic letters, stickers, and pipe cleaners. I also brought wrapped books and he unwrapped one each night. Some were new, but others were old favorites that had been forgotten. We don't have a DVD player. But we have an iPad. Technology can be wonderful! We're driving to Florida in 2 weeks and I have a basket for each boy. I do themed "activity packs" in gallon ziplock bags so we can alternate the toys in the buckets (the trip is 2 days each way). I include books in each activity pack - the dinosaur pack has several dinosaur books (in addition to a puzzle, dinosaur skeleton kit, etc.) - we have a space pack, spy pack, and a few others for my six and eight year old boys. They love the activities and learn a lot while on the road!